Wendy Chiderster primareily finds models for her still lifes in antique stores. Constantly on the lookout for old, forgotten objects that speak to her, she finds the answer in discarded or dismantled items that were once used in the home or on vaction or in the office. Once found, these objects become the forcal point of her contemporary still life paintings. "I have a passion for old objects. . .usually something heavy and combersome. 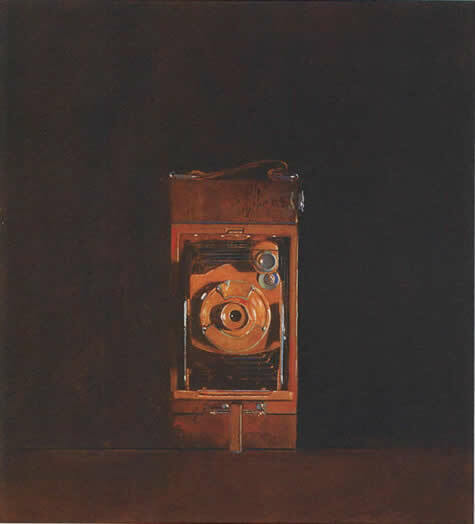 It's an unexpected subject matter in the gallery; you don't normally see old typewriters or cameras in paintings," Chidester says from her studio in Utah. "All of these items that were once commonplace and are now obsolete are fun to paint. I try to bring new life to old objects and evoke memories of days past in each painting." Exaggerating color and using multiple glzes allows Chidester to acheive a nostalgic, almost monochromatic, quality that here collectors appreciate. Each painting is carefully rendered in a realistic yet painterly manner. "I enjoy making the painting surgace as rich and as interesting as th objects themsleves, giving each painting a feeling of age, depth and beauty," she says. Over the years Chidester has amassed quite a personal collection of old everyday props, several of which are hard to find in one iece because many are disassembled. "I love to find the piece, stage the object, and paint it. Usually I've forgotten those objects until I find them. Even my own kids are intrigued by the items, but to me, it was just yesterday we were typing on a typewriter," she says. In her first solo show at Giacobbe-Fritz Fine Art, Chidester presents a variety of old objects that are obsolete. Some are place in a single composition making it more monumental while others are grouped. Permanently Shelved shows a large grouping of discarded office items with emphasis placed on the antique manual typewriter. Unusual in its horizontal format, Permanently Shelved is among the larger pieces in teh show at 28 by 60 inches. 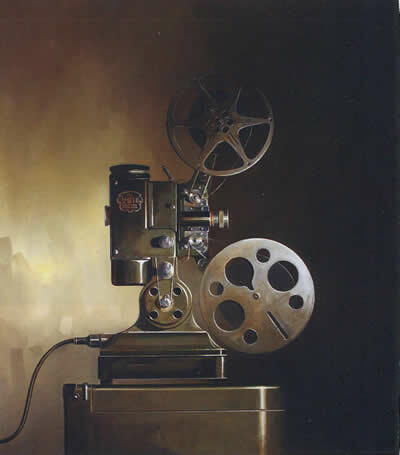 Ampro Precision Projector, oil on canvas 45x40"
The Collector Says . . .
"Wendy Chidester's paintings take me down memory lane to a yesturday far removed from our computer age." Permantly Shelved, oil on canvas 28x60"
Rainbow Hawkeye Vest Pocket Brown , oil on canvas, 22x20"
"I like having the items taged side by side. And it was fun to play with the tie going up and over," Chidester says. In this body of work the artist also experiments with painting objects against the same colored background as evidenced in her Rainbow Hawkeye Camera series.